I love this blog, but it stagnates. Often. If I’m honest it’s because at some point I convinced myself that certain content wasn’t worthy of an “official” blog post. If I hadn’t spent hours slaving over prose and obsessing about message, it wasn’t good enough to send out into the world. That kind of thinking hinders me. It means that if I don’t have gobs of hours to set aside for a polished post then I just won’t bother. What a shame. Smart creative people know that the good stuff comes not out of the thinking but the doing of it. Keep putting content out there instead of cowardly fantasizing about the perfect article/painting/photo/song/movie script, etc. Isn’t it the spontaneity that makes a blog special after all? And why should my awesome Paris-loving followers wait 6 months between posts, when I’m constantly coming across things I want to share? With that in mind, all I want to do today is post some of my photos I’m proud of. That’s it. I don’t know why it’s so hard for me to make it an official blog post. And I don’t know why I needed to preface them with the confession you just read. I guess I needed to mention it so I’ll feel allowed to share more bite-sized posts in the future. Because hell this was meant to be a fun online journal of my Paris experience, not the damn travel section of the New York Times. Know your medium, Corey! So expect to hear from this blog more often. 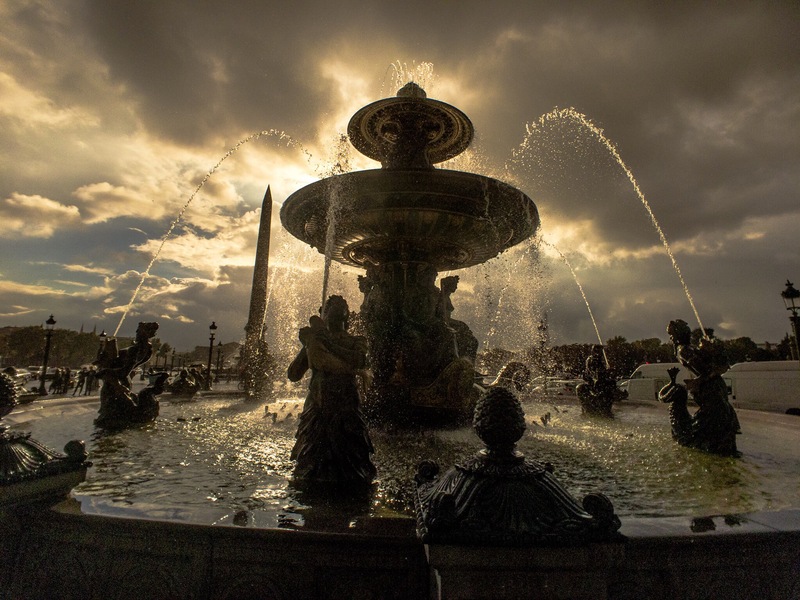 And above all, enjoy these views of the fountains of Place de la Concorde. It was one of those days where the sun shined through a rainstorm. While tourists calmly posed in front of them I was running around like a madman trying to capture the light as best I could. Thank you bonnie, that’s nice to hear! Hurrah! Here’s one very pleased reader at this new strategy. Co, you definitely have an artist eye. These pics are breathtaking. Thanks, and keep them coming!!!! Your pictures are lovely! I’ve been back from Paris only 1 week today and wish I was back. I miss it so. Keep up the good job! Thanks a lot for your comment. Yes it’s hard to leave Paris, I had to do it several times before I moved here for real. Don’t worry, if ever there’s a city that warrants coming back it’s Paris! Have a great day. Loved meeting you this summer as a tour guide for my friend Cristina and me. Love, Love Love your pics and def. blog more!!!! I am a Spanish teacher falling in love with France!!!!! Thank you Kim, glad you had a nice time in Paris! I have thought the same about my blog! Life gets so busy sometimes, it’s hard to burn the candles at both ends. I know, it’s quite hard to find the time and energy for all the little projects I want to do. Thanks for your comment, it’s nice to hear there are others! Hi there….the photos are amazing as usual….and February 17th draws closer….i am thinking my favourite…probably not yours…as if is a bit touristy though not really…now I sound like you….only an older version…anyway back to the subject….photos amazing as usual ….February 17th…..Arts et Métiers cafe?? ?….at the metro stop…?? Keep up the excellent photography…and work on those baby steps!!! Hello, yes that café is fine for me. Sounds like a plan! Hello Kerrin, I guess you didn’t get my last message because I waited an hour for you in the Arts et Métiers café! I had to leave at 3 o’clock, sorry it didn’t work out but I hope you have a nice Paris trip. I’m glad to hear I’m not the only one! Perfectionism can drive you to make wonderful things, but there’s such a fine line between that and being scared to share something inferior. There are so many reasons not to do something, it’s just a question of which voices you want to listen to! Thanks for your comment and have a great day. Thank you for the lovely comment. Isn’t it true how nasty people can be thanks to the anonymity of the internet! Please don’t take it to heart, people just like to get reactions. It is ironic that the more you love and respect writing the more it can paralyze you. It’s just another step along the process I guess. I hope you have a wonderful day! YAY! How wonderful to find you among the day’s most recent posts, Corey. Yeah, most creative people agonize about whether something is good enough or ready to share with the world. But let me assure you with an emphatic HELL YES that your writing and photographs are *always* worth sharing. You have a wonderful voice and a great eye — and I look forward to seeing more of both. Thank you Heather, you certainly take the prize as one of my most enthusiastic and supportive followers! Isn’t it funny how being a creative person is in someways trying to constantly trick yourself into avoiding parts of your brain, ha ha. I’m honored to be one of your most enthusiastic and supportive followers, Corey! I think you’re amazing, and your posts always inspire me. I’m so glad to see you back. I had all kinds of irrational thoughts, like you’d been so traumatized by the attack on Paris that you’d never write again. I’m glad it’s not that. The photos are just stunning. Keep ’em coming. I know that stalled feeling on the blog. I have a (prospective) post that has been sitting in the Draft bin for weeks, stretching into months. And it’s not even because I aspire to greatness. All I really intended was snippets from daily life. Hello Lee, nice to hear from you! Sorry to hear you’re having a similar problem. Don’t be afraid to just publish that post, it will help you move onto the next one and the next one, and I’m sure your followers will appreciate it. The attacks in Paris actually made me appreciate the city even more, and I’ve been taking so many photos and notes about things I want to share, but I could never find the time or inspiration to form them into complete blog posts. I hope to improve upon that moving forward. Best of luck and have a lovely day! Keep ’em coming — bite-size or whole enchilada, love your work! That’s so nice of you to say, thanks for taking the time to comment! I look forward to posting more stuff. Thank you Vincent, I appreciate you taking the time to leave a note. Nice to know I’m not alone on overthinking and reediting. I don’t think you can go wrong with posting pictures. Probably most people don’t read the text anyway!! Thanks for commenting! No you are not alone. And you’re definitely right about people reading less and less! What a wonderful words, thank you. I actually didn’t expect such a volume of lovely comments. You’re very kind to offer your support. Have a wonderful day. Glad to see another post from you! I was in Paris a couple of months ago and wished I had more inside info – you had been silent so long! I’ll be interested in comparing your new posts to my quite unpolished ones coming up about my time in Paris. (I ‘m slow to post not because I’m wanting more polish, but because I don’t post when I’m traveling- takes away from the experience. Have to come home, sort photos, and go through my notes – but I’m up to day 5 of my three week trip, so lots more to come! Thanks for leaving a note. Boy isn’t it work to go through vacation photos? A daunting task. Best of luck! 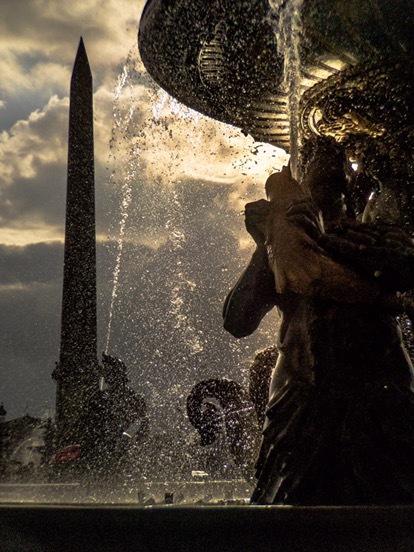 Your photos are most artistic – thank you for sharing. We’ve been home from Paris just over a week now, and you help keep the city alive in our hearts. The photos are beautiful. I enjoy reading about your experiences and didn’t realise how you agonise over your posts!! I love Paris and your blog just brings me that much closer to being there. Thanks. Thank you Lauren. So happy I can help bring you closer to Paris. That was my original intention with this blog. Absolutely spectacular photos! I know that light, I’ve been there on some of the same kind of days in Paris. It’s like some mad clash of the gods of light and darkness with black clouds over you and shafts of gold around the edges. More of same, please! Don’t worry about polished posts. Your pics are great! As someone who loves Paris but can’t get there often enough I enjoy hearing anything at all about my favorite city! Perfection is the enemy of the good, and you are good. I enjoy your photos and your blog posts, and I think they’re fabulous. So nice of you to say! These wonderful Congress have emboldened me to keep posting. Your pictures are exquisite. 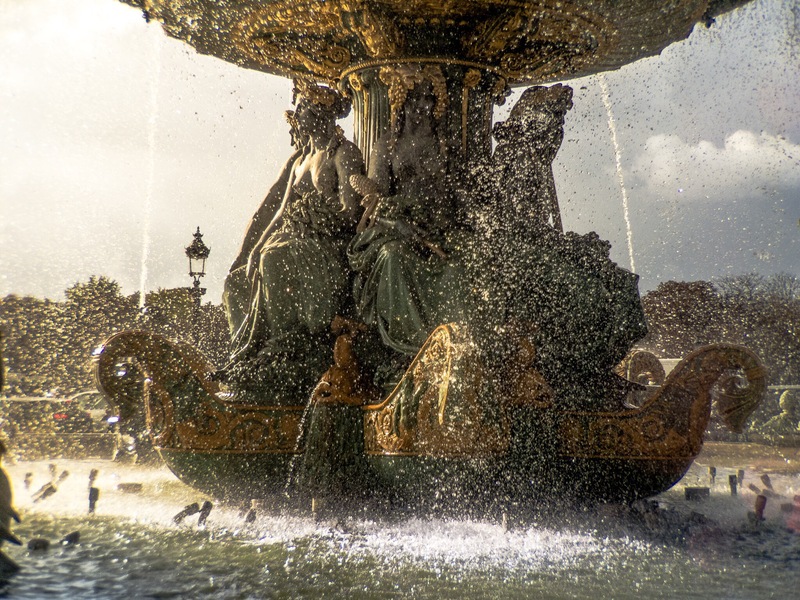 You show Paris in a way few people ever get to see, so please just keep the pictures coming for us francophiles. Thank you Margo, comments like yours make me want to continue posting. Have a lovely day. I struggle with the same mind block as you with my blog and social media posts. Reading your post was liberating for me – I’m sure you have just helped a lot of us bloggers to chill and just be “us”. Thank you Emily, it does help to know that many of us are going through this sort of thing from time to time. We all have certain standards for what we want to put out into the world, but there’s really a fine line between being conscientious and being scared to create something less than perfect. Bon courage to you! 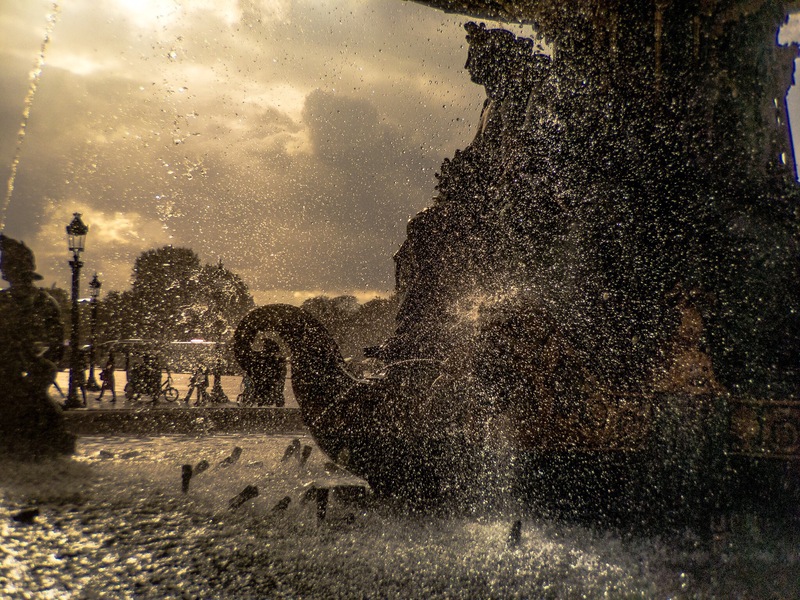 French fried, Corey…your photos are amazing and they give me yet another reason to make a return Paris trip. Don’t obsess about the verbiage…short and sweet is perfectly fine when the days are full and commitments take over your life. I love your posts and photos….no matter the length…the photos take us on another journey. Always welcome and an extra special touch to the day. Happily to you. What a sweet comment Sally, thank you. I’ll do my best to send some more special touches when I can! Have a lovely day and take care. I’m back in Paris and walked along the rue des Martyrs again. Thanks to your delightful tour in April, I took my friend and my daughter and her husband back and had lunch at the Hotel Amour and coffee at The Dream Cafe. We stayed on the rue for half a day. Looking forward to your next wonderful blog post. Hi Cheryl, hope you’re well. Sounds like you played the tour guide this time, that’s great! I was just back on that street the other day, it really is a fun one. I always end up eating and drinking something by the time I get to the end. Take care and hope to see you again sometime! 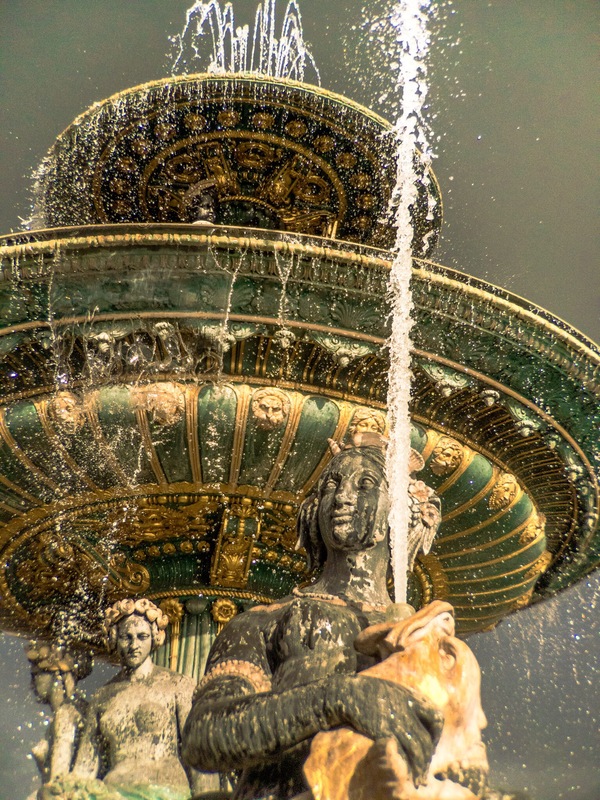 Your photographs of Paris are a delight, especially to those of us no longer able (or willing) to travel as much as we once did; so please keep them coming as and when you can – the memories they resurrect cost nothing and are a source of great joy. What a lovely, lovely comment Maureen. Thank you so much. This and many other messages I’ve received have really encouraged me to continue sharing. Have a wonderful day and take care. Thank you for following along Keryn! I’m so happy to know there are other Paris fans to make my posts worthwhile. The response to this post has been a pleasant surprise. Confession: I’ve only posted 2 or 3 times on my blog this year, and I feel bad about it. You’ve inspired me to post! Thanks for the affirmation Jeanette! Have a lovely day. P.S. Wow 7 times! Love your work..your art…and yes your way with words…glorious! I loved the photos they are amazing. I am a beginner blogger, so to see someone struggling with something that I do too (posting blog worthy content) really opened my eyes. At the end of the day it is all about spontaneity and not perfection. Thanks.